By Chris Williams: Adrien Broner wasn’t in the mood to admit that he’d lost to Manny Pacquiao at the post-fight press conference last Saturday night at the MGM Grand in Las Vegas, Nevada. Never the less, the final punch stats told the story. Broner landed just 50 punches in the entire fight, and that was never going to be enough for him to beat the 40-year-old Pacquiao (61-7-2, 39 KOs) to take his World Boxing Association welterweight title on SHOWTIME PPV. The final punch stats show beyond a shadow of a doubt that Broner was in over his head against Pacquiao. When you’re getting out-landed two to one in the fight, it’s a sign that you didn’t do enough to get the victory. Pacquiao connected with over twice as many punches as Broner did in landing 112 of 568 shots for a 20 percent connect percentage, according to CompuBox’s stats. 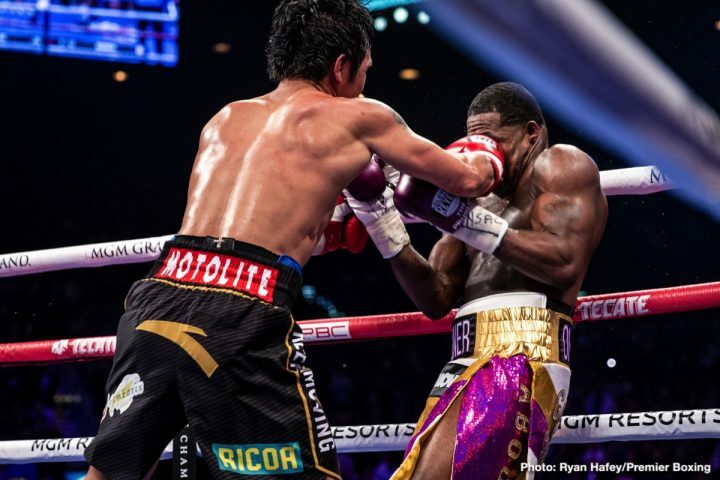 While the connect rate obviously wasn’t good for Pacquiao, the sheer number of shots that he landed in comparison to Broner was more than enough for him to get the ‘W’ last Saturday night. Broner landed 50 of 295 punches for a 17 percent connect rate. Broner was beaten to the punch the entire night, and badly rocked on several occasions by the 40-year-old Pacquiao. For Broner to stand there and say that he deserved the victory, it comes ac cross as disingenuous on his part. With all the experience that Broner has as a pro, he’s got to know that he didn’t win the fight. Broner was fighting too defensively in the second half of the contest, looking to survive the full 12 round bout to fight another day. Broner choosing to not admit that he lost is a way that some fighters use to try and muddy the water by making impressionable boxing fans think that there was controversy where was actually none. It’s an old trick. if fighters don’t admit that they lost, it helps them keep their fans. At the same time, it disrupts the credit that their opponent should be getting for having beaten them. “With my performance tonight I feel like I won the fight,” Broner said. “My performance tonight talked for me. They thought I was going to come in here and be in the mud and they was just going to move around me and f— me up, and I came and I gave them what they wasn’t looking for. Hell yeah I believe I won the fight. I don’t feel bad for myself, I feel good,” Broner said. This was a bad match-up for Broner from the start. He doesn’t do well against volume punchers, and it was situation where he was put in the position where he was going to have to either knock Manny out or else he was going to lose by a wide decision. The three judges gave Broner more credit than he arguably deserved in giving him 3 to 4 rounds against Pacquiao. It could have been much worse than that if the judges were scoring the way that the boxing fans were seeing. It was hard to find rounds for Broner, because he was fighting only fighting in spurts. “They was hoping that I came in here and just got destroyed, which that didn’t happen. And, you know, I knew I was the underdog and they was against me already but it’s alright. I’ll be back and I will be champion,” Broner said. People were predicting that Broner would lose to Pacquiao, but only because of his past losses when he’d stepped up against good opposition. Broner had already shown well before the Pacquiao fight that he can’t cut it at the elite level. The boxing media, the fans and the odds-makers had seen from Broner’s fights against the likes of Shawn Porter, Mikey Garcia and Marcos Maidana that he loses when he steps up against fighters. Since Pacquiao is one of the better fighters in the welterweight division, it wasn’t hard for people to predict the outcome for his fight against Broner. You can blame Broner for that. If he was as good as he believes himself, he wouldn’t have lost to all those guys. The fact that Broner keeps losing shows that he’s not good enough to cut it at the top level at 147. Premier Boxing Champion management need to understand that Broner lacks the skills to beat the best, so they can match him appropriately against fighters that he can beat. If that means that Broner should move back down to 135 or 140, then so be it. PBC needs to give Broner some helpful advice so that he can have a better chance of success with the remaining years he has of his career. Right now, Broner is on a downward spiral with his career. If he doesn’t move back down in weight, he’s going to run out of usefulness as a B-side opponent for the lions in the welterweight division. “I fought champion after champion after champion after champion. And if they ask me to fight anybody that’s a champion right now I’m gonna fight them,” Broner said. The problem with Broner is he’s lost against many of the good fighters he’s faced during his career, and he has controversial fights where he probably should have been given a loss. Broner’s fights with Malignaggi, Granados, Ponce De Leon and Vargas were matches that could have been losses for Broner. So instead of Broner’s record being 33-4-1 right now, a more realistic record would be 30-8. Broner has been very lucky when it comes to the scoring for some of his past fights. If you take away the controversial decisions, Broner is more of a high level journeyman level fighter than a championship level guy.